Sometimes Mexican cravings hit a little early like Meatless Monday instead of on Taco Tuesday. Kidding of course because if you ask me Mexican food is good any day of the week. Vegan Cheesy Sweet Potato Nacho Bowls are perfect for Meatless Monday or any time you get the craving! I would like to think of myself as an equal opportunity Mexican food lover. I love tacos in any form, nachos, fajitas, and don’t even get me started on guac! While I like the traditional I also like the fun, like my Asian Guacamole or Vegan Kimichi Nachos. When trying to make things healthier I opt for taco salads or taco bowls. Or I swap chips for sweet potatoes! If you haven’t tried Mexican with sweet potatoes you need to, SOON. Mexican stuffed sweet potatoes or nacho style, here are some I’ve shared over the years. Loving everything in bowls lately I had to make a nacho bowl version. 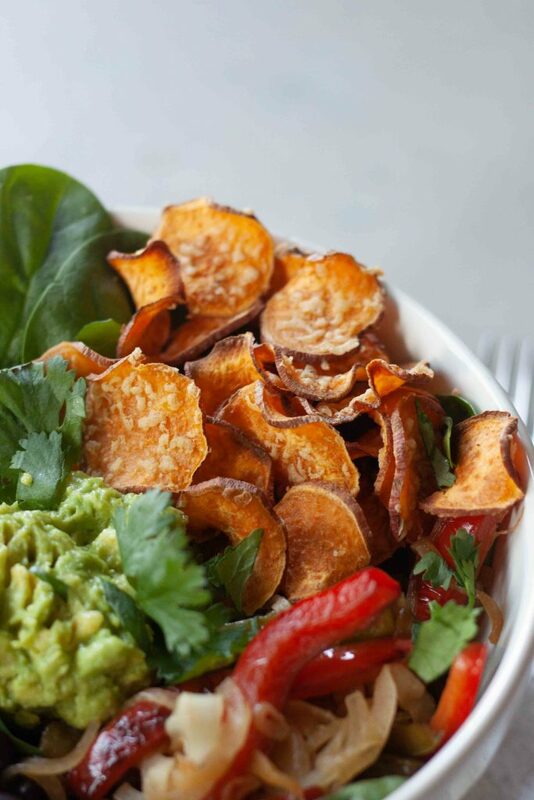 While this bowl is delicious with plain sweet potato chips I like taking it to the next level with cheesy sweet potato chips! After playing I found my favorite being with a Smoked Vegan Mozz cheese melted over top for a little smoky flavor. Options are endless though and you can use any cheese you like. Toppings are also up to you but I’m all about the grilled veggies, black beans, salsa, and all the guacamole! Also adding in greens but instead of going with romaine or iceberg lettuce I’ve been going with baby spinach. Made with small sweet potatoes I can just dig in with a fork. If I only have jumbo sweet potatoes I’ll make them bigger, mix it all together and use the sweet potatoes as big scoops. Of course there are times when you don’t have sweet potatoes and still get the craving and I reach for my favorite sprouted tortilla chips. Shh sometimes melting cheese on those too but not usually. This is a perfect weeknight meal that can be pulled together in less than 30 minutes. Customizable too so everyone in our house is happy. Extra guac, peppers and onions, and salsa for me please! Again it’s Meatless Monday and I look forward to seeing what’s happening in your kitchen and hope you link up with me and my co-host Deborah and share! I also hope you check out and are inspired by the recipes linked up below. 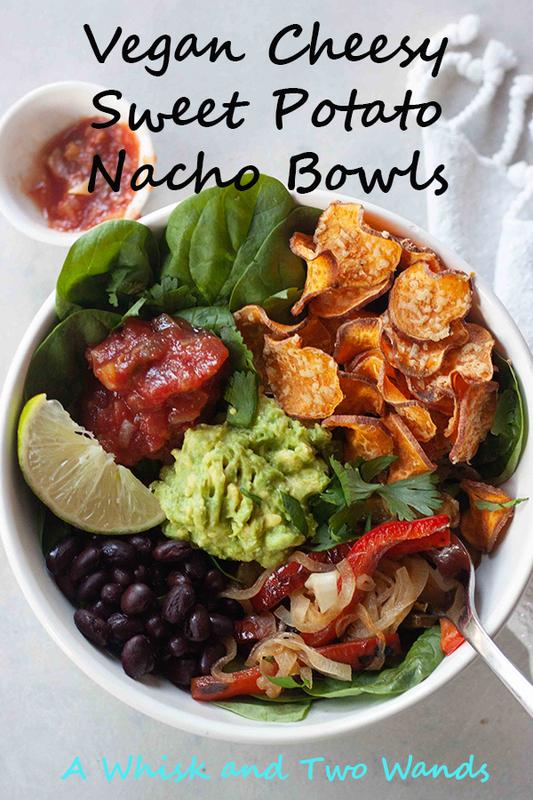 Vegan Cheesy Sweet Potato Nacho Bowls are flavor and nutrition packed bowls to satisfy your Mexican cravings any night of the week. Vegan and gluten free. Wash sweet potatoes and thinly slice, if possible using a mandolin so they are thin and even about 1/8" thick. Put slices in a large bowl and toss with oil to evenly coat, starting with 1 tablespoon and adding more as needed. Alternatively you can spay them with coconut or avocado oil spray. Arrange in an even later on prepared baking sheets. Shredded/sprinkle cheese over top of the potato slices. If using the Smoked Vegan Mozz I find it easier to shred when frozen and then just use a box grater to grate over top. Bake potatoes for 20 minutes, or until crisp and cheese is melty. Checking them around 15 minutes. While the potatoes are cooking prepare the peppers and onions in a skillet (I like cast iron) with a small amount of oil over medium heat. Sauté for about 10 minutes until tender. Heat beans just to warm, if desired. Cut and remove pits from avocado and smash or use your favorite guacamole. 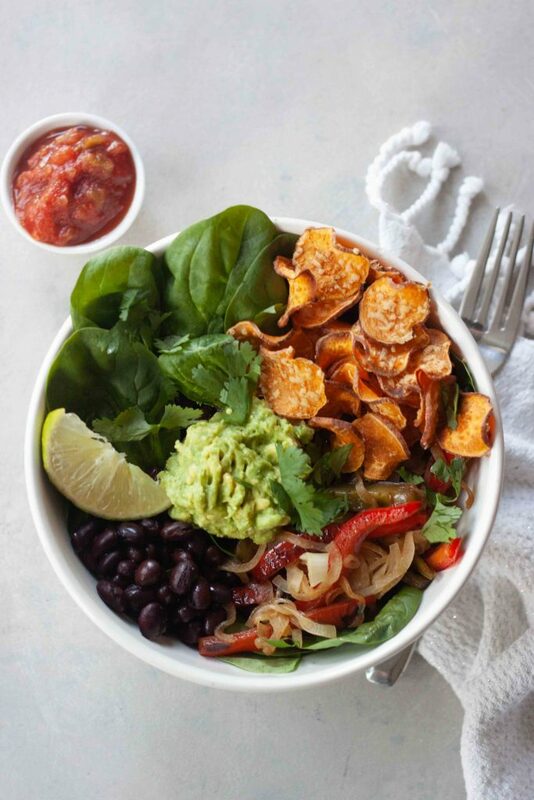 To prepare bowls add greens and top with beans, peppers and onions, cheesy sweet potato chips, guacamole, salsa and other toppings of choice. Finish sprinkling fresh cilantro over top. 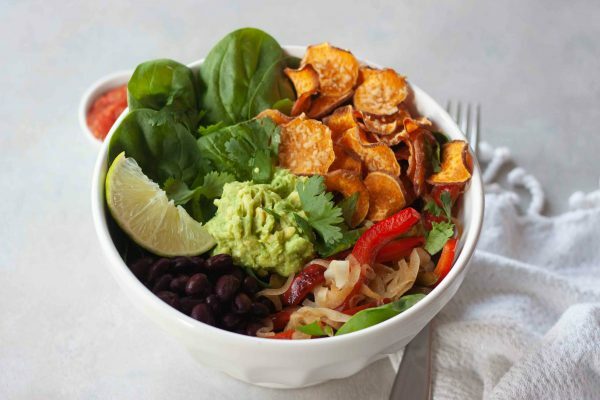 Ooh I like the idea of using sweet potato chips in this bowl! I could also Mexican food any day of the week. Have a good one! Im always up for Mexican flavors! 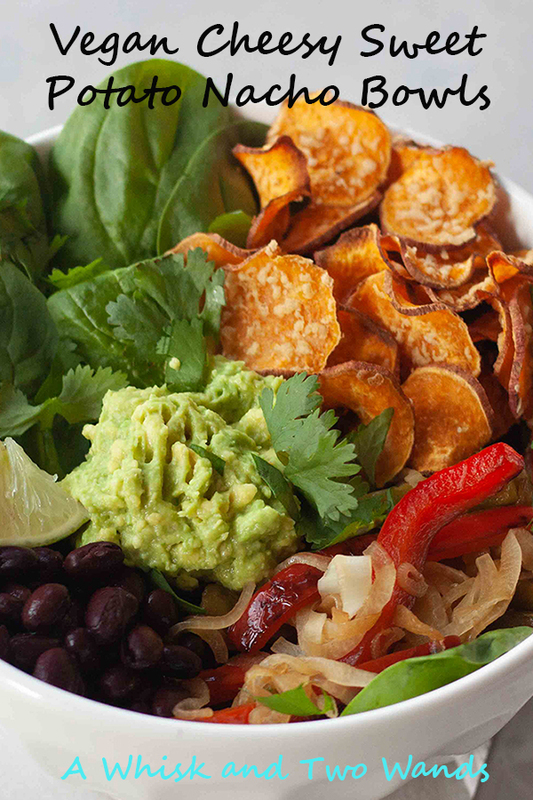 Im also always up for nachos and sweet potato and pretty much everything in this! LOL Great looking bowl. Sounds like this was made for you! I love that you have sweet potato chips in there. This bowl looks awesome.